If you want to know more about the three finalists for The Story Prize, Google them. You'll find video, audio, interviews, excerpts, reviews. You can learn a lot about Anthony Doerr, Yiyun Li, and Suzanne Rivecca and their books via the Internet. Or you can come and see them live. The Story Prize event on March 2, provides an opportunity that you can't experience electronically. Sure, there will be a Webcast you can watch ten days or so later. But seeing someone in three dimensions and sensing his or her presence, is a very different experience. 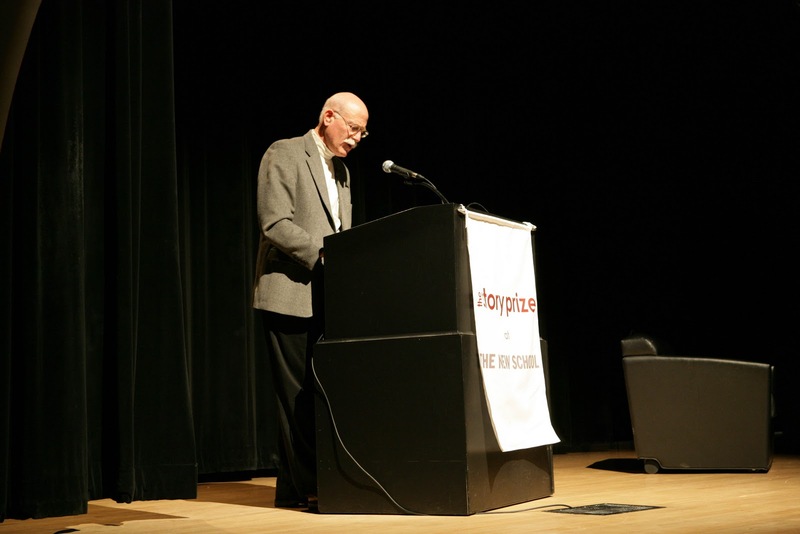 Ask anyone who was there two years ago to hear Tobias Wolff read "Bullet in the Brain" in its entirety, and they will tell you that a Webcast is a poor substitute. There's also a certain energy in a room where hundreds of people gather to listen. So if you love short stories, live in or close to New York City, and are available the night of The Story Prize event, I urge you to try to make it to the New School's Tishman auditorium (tickets are $14). You'll see and hear the authors read excerpts from their books and discuss their work on-stage. I try to make that discussion a conversation that the audience is overhearing. I don't write questions ahead of time, and the authors generally depart from their talking points and say things they haven't said before that reveal how they work and how they view the world. If you're there, you'll also feel the tension and energy in the room when Julie Lindsey, the founder of The Story Prize announces the winner. Despite the suspense of that moment, I would add that the event is not just about the winning book for us. We aim to shine the spotlight equally on each author and to celebrate everyone's work—all three finalists, of course, but also the authors on the long list, every author who wrote a short story collection in 2010, and everyone reading and writing short stories and keeping the form alive and kicking in the digital age. 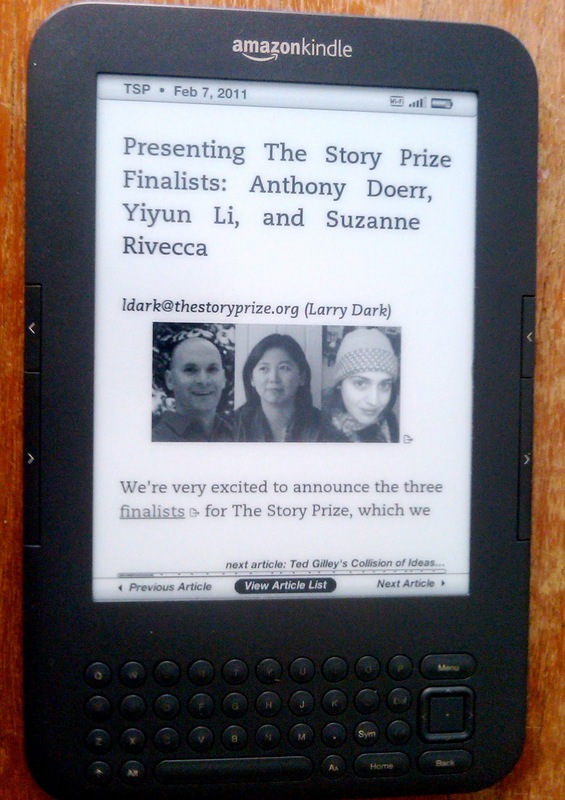 Exciting news: Each of the three finalists for The Story Prize—Anthony Doerr, Yiyun Li, and Suzanne Rivecca—will have a story from their nominated collections appear on Storyville in the weeks ahead, leading up to the March 2 event at The New School in New York city. What is Storyville? 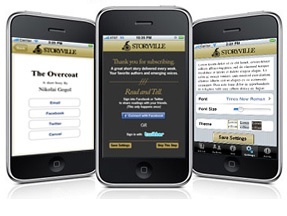 It's an app for iPad or iPhone that each week delivers a short story directly to a subscriber's device. The stories come from published collections, and an author statement accompanies them. The app also interacts with Twitter and Facebook. The creator and publisher of Storyville, Paul Vidich, is no stranger to this blog. He has twice contributed guest posts about digital distribution. Most importantly, he's a a short story writer and evangelist, who spent more than a year developing the idea for this app. The $4.95 price for a six-month subscription to Storyville allows readers to sample a substantial number of story collections. In this case, I hope a taste of Doerr's Memory Wall, Li's Gold Boy, Emerald Girl, and Rivecca's Death Is Not an Option will lead readers to buy the books. For our part, we're offering Storyville pairs of tickets to The Story Prize event to give away each week that one of these stories runs. That means a few subscribers will get to see the authors read from and discuss their work live on-stage, taking readers on a trip from the newest platform for stories to the oldest.